I have made these bowls before, but the seasonings and salsa I used this time made them so much more delicious! The macros don’t include it, but I also included 1/2 an avocado in mine! -Sauté bell peppers for 3 minutes on medium heat, then add in poblano peppers and cook for 3 more minutes before adding in green peppers. Cook until veggies are softened. 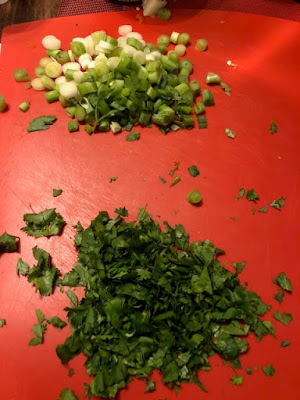 -Mix all together and top with salsa, pinch of cilantro, and avocado if you choose!